As a cumulative preference shareholder of the beleaguered Hyflux, I have the privilege to attend the second town hall meeting organised jointly by the Securities Investors Association Singapore (SIAS) and Hyflux on the evening of 18 January 2019. Here is a brief synopsis of the proceedings during the meeting. It was unsurprising to see a huge turnout during the event, and many security holders of Hyflux were in a state of anguish to understand what has been happening since October 2018 when Indonesian conglomerates Salim and Medco Group (SMI) were chosen by the Board of Directors (BOD) as the strategic shareholders of Hyflux to undertake the reorganisation process. Despite the anguish expressed by many of the security holders who turned up for the town hall meeting, many shareholders do express some hope that there could be some light at the end of the tunnel. However, most of the security holders expressed their dissatisfaction over the continued directorship of Ms. Olivia Lum, who is the founder and chairman of the beleaguered water treatment group. Ms. Lim’s presence appeared to have irked a majority of the security holders who were present, but they managed to hold back their frustration when Ms. Lum indicated that she would no longer control Hyflux, and with SMI coming in as a strategic investor, it was essentially a ‘takeover” of the company. 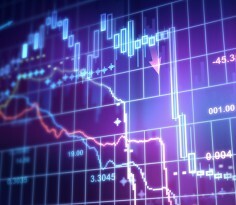 For the sake of the holders of the six percent, cumulative, non-convertible, non-voting perpetual Class A preference shares (Class A CPS), most may recall that on April 13, 2011, Hyflux issued a public offering of up to $200 million worth of Class A CPS priced at an issue price of $1.00 per share to fund the construction of a water treatment plant in the Middle-East region. According to the offering’s term sheet, the semi-annual payment Class A CPS comes with a perpetual term, and a step-up dividend of up to 8 percent per annum, up from the default dividend rate of 6 percent per annum if the Class A CPS was not redeemed back on 25 April 2018. 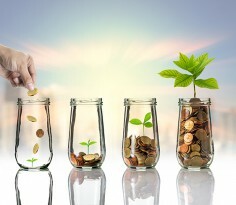 At the time of the offering, the Class A CPS was also an eligible, and approved security under the Central Provident Fund (CPF) Investment Scheme. Fast forward to May 22, 2018, Hyflux and its five subsidiaries unexpectedly announced that they sought court protection in order to restructure its bloated debt load. At that time, Hyflux was granted a six-month moratorium, which was extended further in the same year. As pointed out in a Shares Investment article dated 02 November 2018, I quoted from 19 October 2018 Business Times (BT) article that the entire Hyflux group had bank debts at about $1.8 billion in June 2018, and note holders were owed $265 million. The perpetual and preference shareholders were owed $900 million in total. 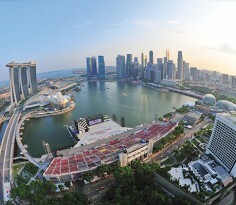 In the latest town hall meeting on 18 January 2019, Hyflux management outlined the process of selection of the potential strategic investors, which numbered about 16, and they comprised Mainland Chinese companies, Southeast Asian conglomerates, US and European strategic investors, and private equity (PE) funds. According to management, those offers ranged from a total investment of (equity and shareholders loan) of $400 to $600 million, and the equity portion ranged from $250 million to $432 million for equity stakes from approximately 51 percent to 86.4 percent. The Board did careful assessments among the bidders, and decided on the proposal laid out by SM Investments (SMI), a consortium comprising the Salim group of companies and Medco group of companies. Altogether, the offer is worth close to $530 million, excluding the $30 million rescue financing package which may or may not be utilised in case of possible hiccups along the way of the deal. The restructuring package is subject to the full and final settlement of the unsecured financial debt, debt securities (perpetual securities and preference shares), contingent debt and trade debt through court-sanctioned schemes of arrangement. There are also regulatory approvals needed and approvals of shareholders at an extraordinary general meeting (EGM) scheduled in late March 2019. In the worst-case scenario, if Hyflux’s security holders voted for the Group to be liquidated, management laid out the potential consequences of such an outcome. According to management, the liquidation process will involve a large group of approximately 120 legal entities with extensive intra-group balances. One of their key assumptions is that the main engineering, procurement, and construction designing (EPC) business would cease activity while many of those entities would remain outside of insolvency processes. Many of these assets are also located offshore, and project assets are collateralised by financial institutions, shareholder agreements, and offtake arrangements. There was also an assumption of the crystallisation of contingent claims which will balloon into higher actual claims in the event of liquidation. 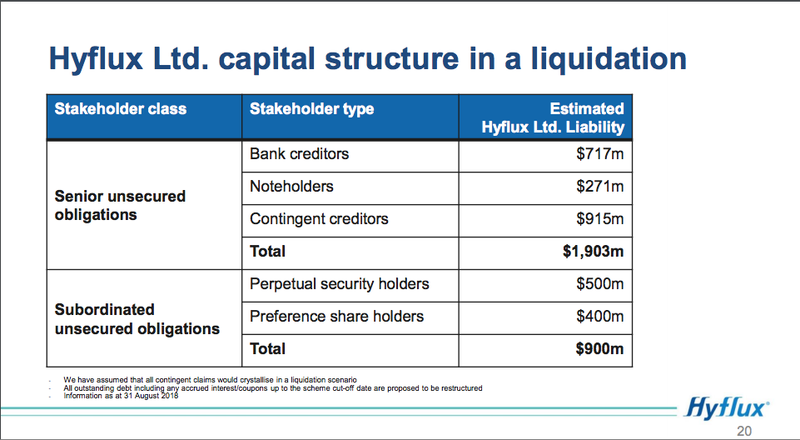 Among the line items shown in the presentation slide above, one might note that contingent liabilities alone amounted to $915 million which exceeded the total balance owed by the subordinated and unsecured obligations at $900 million. 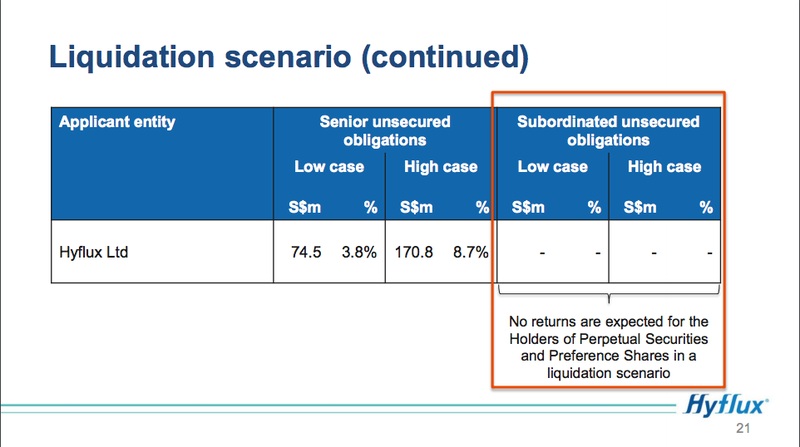 With that, the following chart shows that in the event of a liquidation scenario, both the perpetual and preference shareholders will essentially lose their entire investment principal, whereas the senior unsecured security holders might still be able to recover some money back. In the 02 November 2018 article, Shares Investment noted that the sale of Tuaspsing Desalination Plant is still outstanding and the balance owed to Maybank, who is the main creditor stood at about $518.4 million at that time. The debt was to have been due on 29 October 2018, according to sources. During the town hall meeting, there were no disclosures indicating that SMI is identified as a potential party interested in buying Tuaspring from Maybank, and there was no updated information as to who are the other parties besides Keppel Corporation and Sembcorp Industries that have came forward to state their intentions of purchasing the water treatment facility, and settle fully the debt obligations owed to Maybank. Drew and Napier, the firm’s lawyers and financial advisers has also acknowledged that that there have not been any buyers since the first town meeting held in 2018 who are willing to come forward to purchase the Tuaspring. I noted that many security holders questioned the intentions of SMI who is coming in with only a 60 percent equity interest on Hyflux without any firm commitment to take over the debt obligations held by Tuaspring that is owed to Maybank. However, it has also been widely emphasised by many market watchers on the importance of settling the outstanding debts owed on Tuaspring in order for the entire group to move forward. 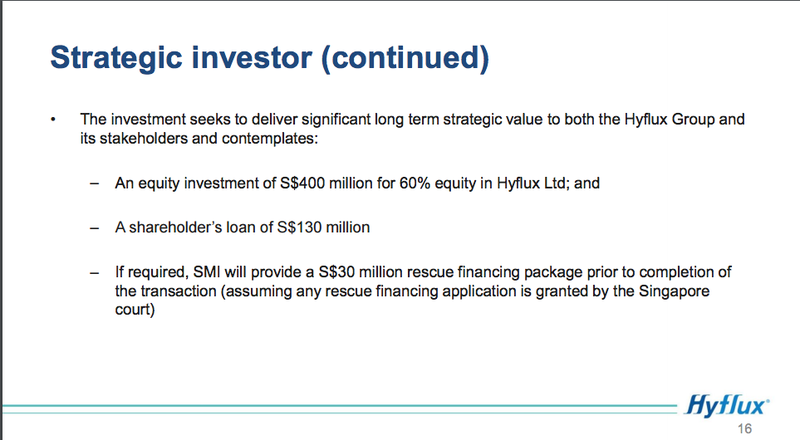 I think that it was quite disappointing for many Hyflux security holders that SMI can only provide an equity lifeline and is reluctant to assume the full obligations including the takeover of the debt obligations owed on the Tuaspring Desalination Plant. The following chart shows the indicative timetable of what is ahead for Hyflux. Management did note that there could be a possibility of Hyflux shares to re-start trading after April 2019, however this is contingent on the completion of the entire restructuring process, and the outcomes which management is striving to complete by end April 2019. This date also coincides the end of the second set of the six-month court moratorium. While SMI is considered as the Group’s chosen strategic investor, many investors, we think, are left with several unanswered questions as the so-called “white knight” (SMI) did not choose to take up the entire interest, including satisfying the loan obligations tied to the Tuaspring Desalination Plant. 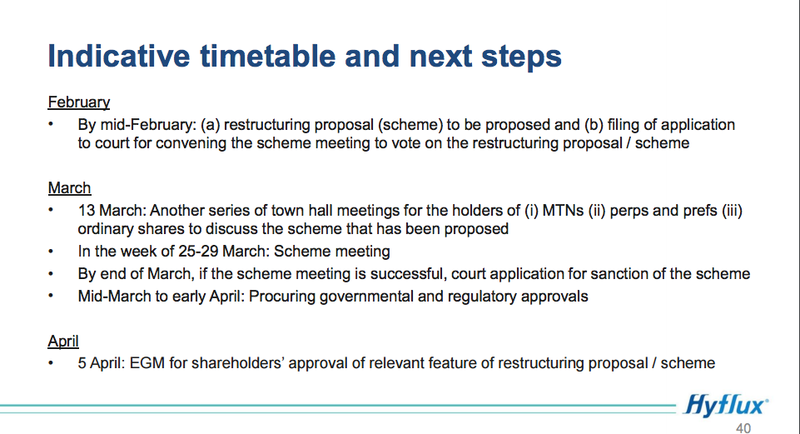 There were also questions about potential heavy dilution of equity interest as management did hint during the meeting that the proposed restructuring plan might include part equity, and part cash, but a majority of the plan will comprise of additional issuance of equity. Management has also stressed that Hyflux’s restructuring plan cannot be compared against the debt extension option pursued by another troubled oil and gas (O&G) firm, Ezion Holdings as Hyflux’s contingent liabilities are tied to project payments relating to the EPC business. They are considered as long-term obligations which cannot be extended when project payments are due. However, I think that many security holders are still unconvinced that management has exhaustively explored other restructuring methods. In view of what was laid out, the personal appeal made by Chairman Olivia Lum to accept the restructuring plan underpins the ultimate fate of Hyflux. However, with so many questions being unanswered, security holders may want Hyflux to come up with a more convincing plan. The finalised restructuring plan is expected to be released in mid-February 2019.